Ruchika Singhal currently works at CR Bard as Vice President, International for the Davol division where she is responsible for driving business growth in international markets. 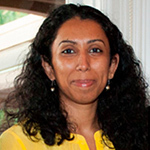 Prior to CR Bard, she worked at Medtronic for fourteen years in various roles across Strategy, International Market Development, Marketing and New Product Development. She has had extensive experience developing businesses in emerging markets and has pioneered scalable and sustainable business models to address health care needs at the bottom of the socio-economic pyramid. She is actively involved in mentoring social businesses and is passionate about women empowerment and healthcare. Ruchika holds a Masters in Biomedical Engineering from the Johns Hopkins University and an MBA in Finance, Strategy & International Business from the University of Chicago, Booth School of Business.